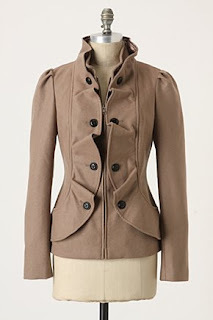 I missed out on this pretty little jacket from Anthropologie, but I think this "coffee bean" version from Macy's is a nice alternative. I love how slimming the jacket is... and the price is pretty nice too! We've been having some problems with my usually reliable laptop. I have a feeling that it's got a nasty little bug... shouldn't take 2 minutes to upload a site, right? Anyhow, once we've got it fixed I'll share some of the holiday pretties that I've been working on.